From a corporate standpoint, the Vulcan Expanding Mandrel (right) was one of its more forgettable products. 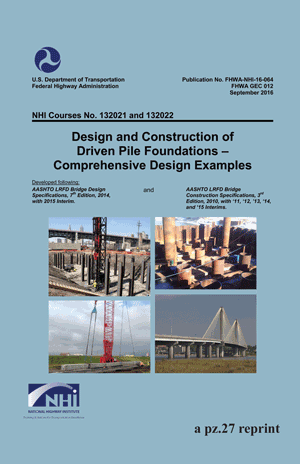 But the application of mandrel-driven shell piles is an important one in deep foundations, as it represents, from a design standpoint, an interesting combination of driven and drilled piles. 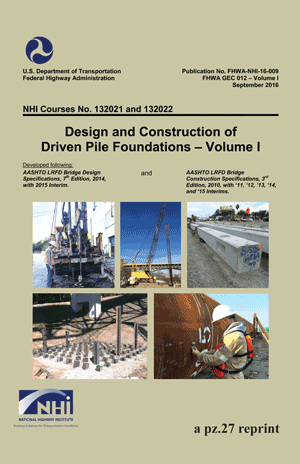 Driven piles can be divided into two types: low displacement piles (such as H-beams and to some extent open-ended pipe piles) and high displacement piles (wood piles, concrete piles and closed-ended pipe piles.) Which one you use depends upon the application and the geotechinical environment you’re working in. Advocates of drilled piles, such as drilled shafts and auger-cast piles, note that, once you’ve drilled the hole into the ground (or while you’re drilling,) you can fill the hole with reinforcing steel and concrete and have a deep foundation. The main weakness to that approach is that, in many soils, the soil will either completely collapse into the hole or contaminate the concrete during the pour, thus compromising the integrity of the foundation. Closed-ended pipe piles eliminate this by providing a barrier between the concrete (which the pile is filled with after driving) and the soil, both along the shaft and at the toe of the pile. They also provide whatever advantage there is in displacing the soil during driving. 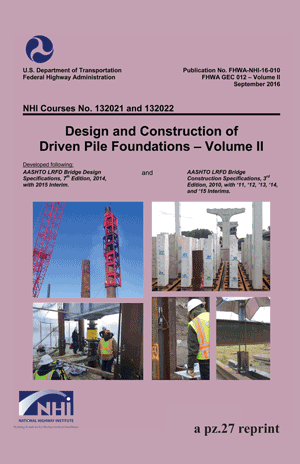 However, to prevent collapse during driving, a minimum wall thickness is required for driving which is beyond what is necessary for the structural integrity of the foundation. Closed ended pipe piles, waiting to be driven. So what if the wall thickness could be reduced, saving the expense of steel unnecessary to the foundation? The answer to that “what if” is mandrel-driven piles. By using a heavy mandrel which is inserted into the pile before installation and driving the mandrel, the impact force is transmitted along the pile shaft, thus reducing the driving stresses the pile experiences (as opposed to transmitted all of them through the pile head.) 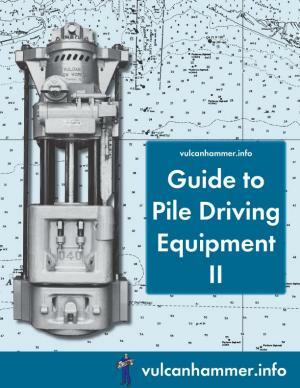 Getting a mandrel that can survive the rigours of driving has been one of the greatest challenges of driven piles. A more generic solution was to use corrugated steel pile, similar to the corrugated pipe used in storm water drainage. Thin walled, reasonably rugged in handing and economical, corrugated shell pile is probably the most common type of mandrel-driven pile in use. The shell is lifted into place in the leaders, the mandrel is inserted into the pile and locked into place, the mandrel and pile are driven into the ground, the mandrel is removed and the shell pile filled with concrete. To prevent soil from plugging the shell, a boot is frequently used at the pile toe. Shell piles can also be installed on a batter (as shown above,) something that drilled piles have serious difficulty with. An interesting side note is that it is necessary in many cases to cut off portions of the shell for proper pile length. In Third World countries, the cut-offs find their way into use as culverts in poor sections where the authorities have not seen fit to provide proper drainage. More details on this can be found in Vulcan Bulletin 90, which you can download by clicking on the cover image to the right. This also shows a cross-section of Vulcan’s mandrel as well. Vulcan’s Expanding Mandrel was designed by Clemens Hoppe of Hercules Concrete Pile, patented under U.S. Patent 2,977,770, and licensed to Vulcan. It was produced in two sizes, 12″ and 14″, which corresponded to the two sizes of shells it was intended to mate with. The driving head at the top of the mandrel was configured to mate with either a Vulcan #1 or Vulcan #0 series of hammers. The mandrel used a system of cams to expand the mating surface of the mandrel to the corrugations of the shell. A manual cam lever at the top of the mandrel is used to expand the mandrel once it has been inserted into the shell. Once the pile is driven, in theory the lever could be used to radially collapse the mandrel and permit its extraction from the driven shell. “In theory” is important because the Vulcan mandrel, in common with just about every other mandrel in use, was prone to become jammed due to the impact of driving. 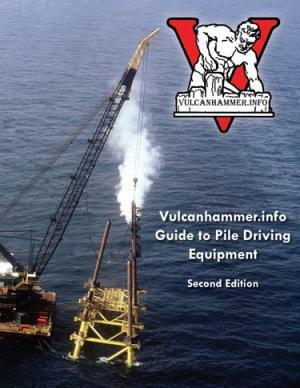 This brings up one aspect of mandrel use that is well known amongst those who do it: mandrel driving is some of the most difficult driving a pile driver can experience (offshore pile driving is probably the most difficult of all.) To start with, the mandrel is by definition a “high impedance” transmitter of force, which means that it presents a high apparent resistance to the hammer. Beyond that, when the mandrel jams, the most common method of freeing it up is a delightful procedure called “bumping out,” where a sling is wound around the mandrel head to a beam above the ram. The ram is sent upward to impact the beam; like a pile extractor, the sling transmits the upward impact to the mandrel head and (hopefully) loosens the mandrel to allow its extraction. Raymond superintendents were especially adept at this, which helped earn them a reputation as hard on the equipment. It also inspired Raymond to develop the full-length column rods and later cables to hold its hammers together, something which Vulcan belatedly adopted. The Vulcan Expanding Mandrel, manufactured primarily at the West Palm Beach facility, was mildly successful, but never dominant in the shell pile market. Although Vulcan’s distribution system was part of the problem, the Vulcan mandrel lacked the durability of the more popular Rusché and Guild Mandrels (something that the latter’s inventor, Charlie Guild, wasn’t shy about reiterating!) Both Guild and Fred Rusché were serious Christians; perhaps their experience in the shell pile installation business was an impetus for that! Charlie Guild may not have cared for the Vulcan mandrel, but the air/steam hammer is another story: below is a photo showing one of Charlie’s Cobi mandrels used with a Vulcan hammer. The Vulcan Expanding Mandrel, probably having just been removed from the shell pile it has just driven at a job in Indio, California, near Palm Springs. At the start of driving, the shell is hoisted into the leaders and the mandrel lifted above the head of the shell and inserted into the shell. In the event that the leaders weren’t long enough for both mandrel and shell, a “doodle pipe” could be used. This is a pipe slightly larger than the shell’s outside diameter, driven at one place on the jobsite and completely clear of internal soil. A shell would be first inserted into the doodle pipe, then the mandrel lowered into the shell and expanded, and finally the assembly would be lifted out of the doodle pipe and positioned for proper installation. Expanding Mandrel on the same site, being driven with its shell by a Vulcan hammer. Nice job sites were a fringe benefit of the mandrel. Here it’s being used in the installation of the foundation of an addition for the Cadillac Hotel in Miami Beach, FL. Today the Cadillac Hotel (a Marriott Courtyard hotel) is on the National Register of Historical Places. Guess that includes the foundation! And after your’re done: because they were intended to be filled with concrete, it was sometimes necessary to clean them out. Vulcan’s solution was the Sly-Vac Pump, which used compressed air to lift the sand and water out of the hole and prepare it for concrete placement. The 1970’s saw the end of the production of the Vulcan Expanding Mandrel.